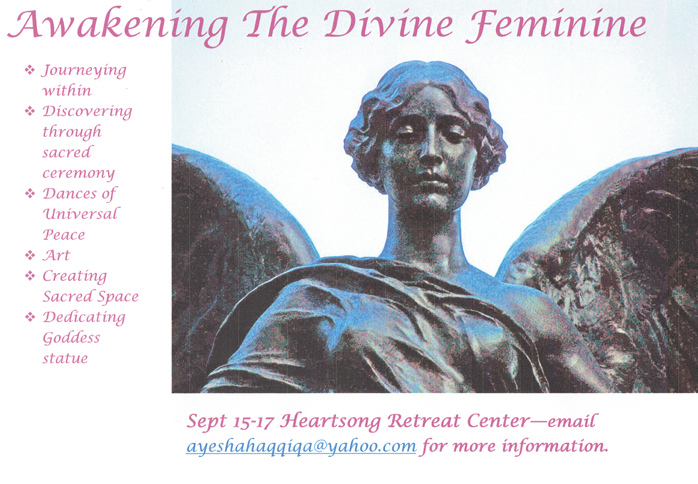 Woman interested in exploring and deepening their connection to the Divine Feminine are invited to “Awakening the Divine Feminine” at Heartsong Retreat Center starting Friday evening, Sept 15, through Sunday morning and early afternoon Sept 17. We will discuss the history and qualities of the Divine Feminine, do shamanistic drumming, create our own Goddess figurines or pendants, experience an all-women sweatlodge ceremony, and explore and find a place for an ancient Goddess figure to be placed at Heartsong. Dances of Universal Peace, handbound journals, and food and fellowship are included!